탄자니아적정기술거점센터에서 개소식을 겸하여 국제학술대회를 개최합니다. 이에 아래와 같이 안내드리오니 관심있으신 분들의 많은 참여 부탁드립니다. ※ 세부사항은 첨부 파일을 참조하여 주시면 감사하겠습니다. 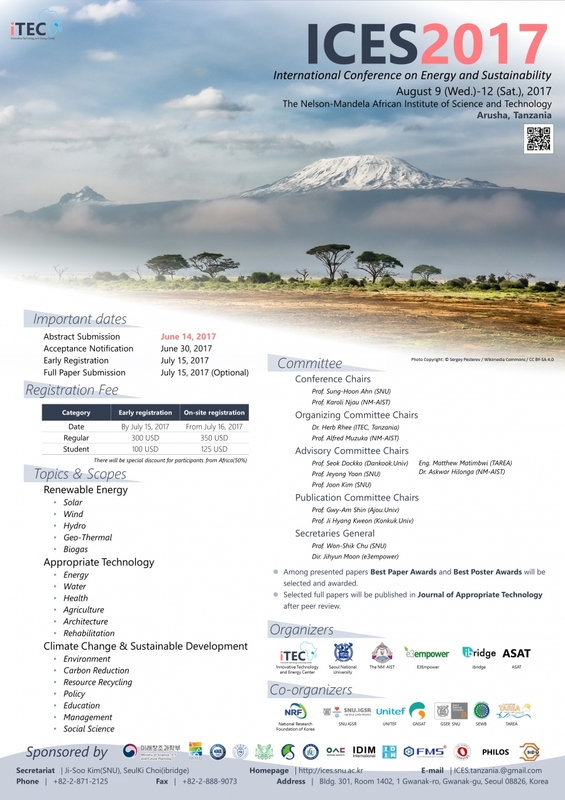 Welcome to the International Conference on Energy and Sustainability (ICES) 2017 to be held from August 9 to August 12, 2017 in Arusha, Tanzania. On behalf of all the committee members of ICES 2017, it is our great honor and pleasure to invite you to the International Conference on Energy and Sustainability 2017. ICES 2017 is mainly focused on renewable energy, sustainability development, and appropriate technology. ICES 2017 will be held at NM-AIST in Arusha, where Mt. Kilimanjaro, Serengeti National Park, and Innovative Technology and Energy Center (ITEC) are located in. This conference will provide a forum for the presentation of the state-of-the-art technology in energy/sustainability/appropriate technology and related fields. We aim to provide opportunities for researchers to exchange knowledge and promote the international and multi-disciplinary collaboration. All organizing committee members of ICES 2017 are dedicated to make this conference both unforgettable and technologically enjoyable. We hope you join us and have a wonderful fellowship time among professional peers. We are all looking forward to seeing you in Arusha, Tanzania.